Eliza Naumann, a seemingly unremarkable nine-year-old, expects never to fit into her gifted family: her autodidact father, Saul, absorbed in his study of Jewish mysticism; her brother, Aaron, the vessel of his father's spiritual ambitions; and her brilliant but distant lawyer-mom, Miriam. But when Eliza sweeps her school and district spelling bees in quick succession, Saul takes it as a sign that she is destined for greatness. In this altered reality, Saul inducts her into his hallowed study and lavishes upon her the attention previously reserved for Aaron, who in his displacement embarks upon a lone quest for spiritual fulfillment. When Miriam's secret life triggers a familial explosion, it is Eliza who must order the chaos. Myla Goldberg lives in Brooklyn, New York, with her husband, Jason Little. "Bee Season is a profound delight, an amazement, a beauty, and is, I hope, a book of the longest of seasons." "Myla Goldberg's Bee Season is a bittersweet coming-of-age in which wise little Eliza Naumann's quirky passion for spelling bees unites and divides her family while revealing universal truths about the often crippling pain of love." "There is such joy and pain thrumming inside Myla Goldberg's spelling bees! She delicately captures one family's spinning out by concentrating equally on the beauty and the despair. 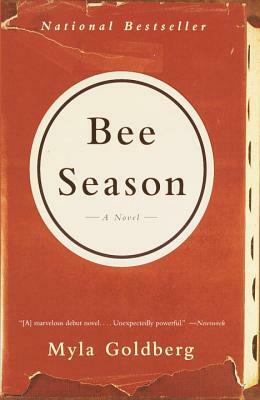 Bee Season is a heartbreaking first novel." "In a story told with unique delicacy and brave inventiveness, a young girl, innocent and all-knowing, learns how much there is to lose, and what it takes to win."